In 2014, on the occasion of the 450th anniversary of Michelangelo Buonarroti\'s death, the Uffizi Gallery opened some rooms of the New Uffizi. Among the new spaces, there were the room of Greek portraits and one dedicated to Ancient art and to the garden of San Marco. The two rooms - which correspond to the numbers 33 and 34 - are on the second floor of the Gallery, and in the museum tour, are located before the 35, the hall dedicated to Michelangelo and his Tondo Doni. The walls of the rooms are green: this color is reminiscent of the works of Paolo Uccello, another master of Italian art and of the Renaissance. The first room, the one dedicated to Greek portraits, is set up like a \"gallery of famous men\". 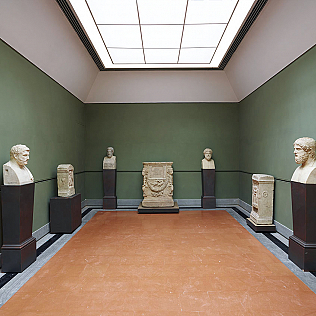 In this space, in fact, we admire a series of marble portraits, Roman copies of Greek originals, dating from the fifth to the third centuries BC. The hall 34, known as the one of the Garden of San Marco, tries to reconstruct the atmosphere that reigned in the garden of the church of San Marco in Florence. This place, created by the will of Lorenzo the Magnificent, was rich in ancient art and inspiration for young artists of the time, including Michelangelo. An artistic academy took place in the garden where statues, sarcophagi and marble reliefs were on display. The two rooms are intended to expose part of the rich collection of ancient art of the museum, but also to acquaint visitors with the artistic, cultural and philosophical atmosphere in which it developed the Florentine Renaissance.